A high school participant works on her team's catapult as part of the design challenge. Embracing the Stranger Things!—this was the theme (based off of the popular Netflix TV series: Stranger Things!) for the fall 2018 Introduce-a-Girl-to-Engineering Day. So, hoping to do just that, around 80 Illinois 9th–12th grade high school girls, mostly from the Chicago area, showed up at Loomis Lab on Saturday, October 27, 2018, with their parents in tow. Some of the stranger things the girls hoped to explore were to find out what engineering actually is, including what different engineering disciplines are like, and whether engineering might be the career for them. So the all-day event, sponsored by the Illinois chapter of SWE (Society for Women Engineers), exposed the girls to hands-on activities in various engineering disciplines, gave them a chance to pick the brains of current engineering students as to what being a student at Illinois is like, and discovered what working with a team of engineers might be like during the Design Challenge. A Civil Engineering student provides "heavy winds" to test on team's tower during the Civil and Structural Engineering session. One key goal of the day was to give participants the opportunity to find out a bit about some of the many different engineering disciplines offered at Illinois. So during the morning session, IGED participants rotated through four different activities. One exposed the girls to Civil Engineering. During this activity, participants used paper and tape to construct a tower that could withstand heavy winds (a fan). A group of high school students enjoy using physics to crush a pop can. During the Electrical Engineering/Computer Science activity, which involved Arduino microcomputers, the girls learned how to use code to spell out words with a string of lights. During a Physics-related activity, participants were to crush a can using just water and a hot plate. The final activity dealt with Mechanical and Bioengineering; during this activity, the girls created prosthetic “hands” out of paint stirrers and brass fasteners. Two high schoolers demonstrate how their prosthetic hands work. A panel of engineering students share with the high school participants what it's like studying engineering at Illinois. To help the girls discover about what it’s like to be engineering students at Illinois, during lunch, the girls (and their parents) had a chance to interact with a panel of Illinois engineering students from many of the different Engineering departments. Some of the questions involved how the panelists ended up choosing their discipline, what their career goals are, and things the younger students can do in high school to prepare for college, to name a few. Electrical Engineering student Liz Boehning explains the activity to a team of IGED participants. IGED participants also found out that Illinois engineering students do more than just study. After lunch, four different RSOs (Registered Student Organizations), including one non-engineering-related organization, gave presentations to inform the girls about the variety of opportunities available for students should they matriculate to Illinois. The featured RSOs included: Engineers Without Borders (EWB), Concrete Canoe (CC), Alpha Omega Epsilon (AOE, an engineering sorority) and the Rube Goldberg Society (RG). Each group gave a short presentation explaining about the benefits of being involved in their organization. A high school student talks about the challenges her team encountered when designing their catapult. A team of Illinois engineering students serve as judges during the testing of the teams' catapult designs. The teams were charged with using the limited materials they were given to create a catapult that would shoot a ping-pong ball at the target. Judges were on hand to rate the projects based on creativity, teamwork/ communication, accuracy, thought process, and the overall product. The girls presented their designs in front of judges and parents as the last activity of the day. Also, recognizing how important one’s parents are when making important life decisions such as choosing a career and deciding where to go to college, the participants’ parents, who had been invited to stay and participate in IGED as well, attended some events that the girls did, such as the introduction and the end-of-the-day activities, but also participated in activities designed just for them. A panel of Illinois engineering students enjoying answering the parents' questions. For example, parents really enjoyed the student panel, where they asked the students questions like: What extracurricular activities do they partitipate in? Do they feel funny because of the ratio of guys to girls in most engineering classes? Can students switch majors if they don’t like the one they originally were admitted in? How did the panelists know Engineering was the career for them? How did they end up choosing Illinois? Students were very candid, humorous, and seemed to enjoy the session just as much as the parents did. In addition, parents had a chance to become more familiar with Illinois during a tour of the Engineering campus. Also, SWE Outreach Director Micki Rentauskas spoke to the parents about how to encourage their daughters in their decision-making processes. Of course, parents were on hand at the end of the day to proudly watch their daughters present what their team had come up with for the engineering design challenge. IGED parent, Maricela Carillo, from Hinsdale, Illinois, appreciates the student panel. He says Sophia, a junior at Orland Park High, wants to go into engineering in a couple of fields, including bioengineering and chemical engineering, and wanted to come to IGED because it looked interesting. Senese indicates that he thought the student panel was great. “I learned a lot of things today since, officially, I didn't go to a state college. I went to a trade school.” What impact did IGED seem to have on his daughter? “I think she seems comfortable here, so we'll see how it goes, he reports. Helping with the various activities of the day were around 40 SWE volunteers, as well as volunteers from other engineering organizations, such as Chi Epsilon (Civil Engineering Honors Society) and Aerospace Outreach. 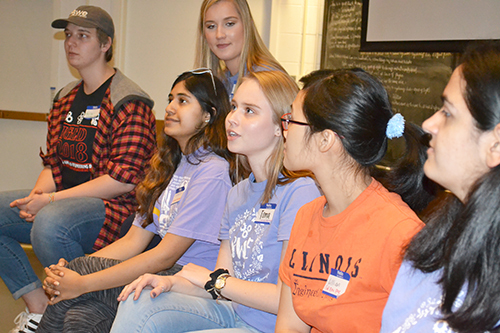 SWE members and other engineering students who helped with the activities were delighted to pass on some of what they'd learned during their studies at Illinois. Several volunteers shared why they got involved in the event. Another SWE member who's passionate about outreach is Jenna Kummer, a junior in Mechanical Science and Engineering who likes to help out with all of SWE's different events in order to pass on her love of engineering to the participants. Of course, her favorite part about IGED was connecting with the girls and learning about what they’re interested in. “So just going around talking to the girls makes me feel happy,” she says. Claire Samojedny (center), interacts with IGED participants working on their tower during the Civil and Structural Engineering session. In addition to her mom’s influence, she shares an anecdote about another interacton that might have planted a seed that engineering might be a viable career for her. She adds that she believes having events like IGED which expose girls to engineering are really important. Karolina Urban and Kylie Burkett, the Fall 2018 IGED Co-Coordinators. The idea of introducing high school students to engineering to give them a head start also resonated with two IGED co-coordinators, who hadn’t done these kinds of events in high school. Based on their experience, the two admit that they were “Trying to spread the word,” and emailed almost every high school in Illinois to get girls to come.” And their efforts paid off. About 80 girls and their parents showed up for the fall 2018 IGED, up 10 from the March 2018 IGED outreach. Burkett shares some of the benefits of girls finding out about engineering in high school versus what the two of them did, which was to apply to college based on their love of math and science, and hope it worked out. She indicates that when she was applying to college, she knew that she liked math and science, and she knew that she wanted to be an engineer, but she had no idea which one, so she randomly applied to civil engineering. Two IGED participants work on their tower during the Civil and Structural Engineering session. “Thankfully, I love it,” she confesses. “I love it so much!” But she admits that maybe if she had gone to an event like this, it might have helped her decide that she liked bioengineering because of an activity. “You get a little background about what the engineering disciplines do, and it definitely gives you that step forward of ‘This is specifically what I want to do in engineering,’ not just, ‘Okay, I like math and science. Where do I go from here?’"
In fact, both Urban and Burkett add that had they done events like this and made a decision in high school, it might have impacted the high school courses they’d taken in preparation. Lindsey Serlovsky, a junior at Orland Park High, works with her team on their catapult as part of the design challenge. Many of the high school participants would probably agree with Urban and Burkett about the importance of participating in events like IGED in order to narrow down which engineering discipline to choose. For instance, Lindsey Serlovsky, a junior from Orland Park, whose favorite activity of the day was the physics can-crushing project, shares why she participated in IGED. No stranger to outreach at Illinois, Serlovsky claims that IGED was her third engineering outreach at Illinois, including another SWE outreach event, and, of course, GLAM GAMES camp, which most likely impacted her decision to do Materials Engineering. Does she think she wants to come to Illinois? “Probably, yeah,” she says. Civil Engineering student Michael Neal moves the fan to point-blank range as he tests a tower a team of high schoolers built during his activity. A team of high schoolers cheers as the engineering student testing their tower moves the fan back to it's original position, having failed to blow their tower over at point blank range. “I walked into the civil engineering activity where they're designing towers to withstand the wind, and the first round we walked in, and the volunteers were like, ‘Oh, we couldn't knock them over because they're all too good!’ Then we were like, ‘Well, these are all civil engineers in this room!" Story and photos by Elizabeth Innes, Communications Specialist, I-STEM Education Initiative. A team of high school students prepare to test their catapult design by launching it at a "Demagorgon."